Taking data and sampling cooled lava as Kilauea erupts. As the eruption at Kilauea volcano turned the southeastern corner of Hawaii’s Big Island into a river of lava this summer, residents and tourists were instructed to stay the hell away. An all-women team of scientists from the United Kingdom, however, was asked to do the exact opposite. In July, five volcanologists from the Universities of Cambridge and Leeds arrived in Hawaii to sample Kilauea volcano’s toxic emissions at the request of the U.S. Geological Survey (USGS). At times wearing gear that would have fit in on the set of a post-apocalyptic movie, the so-called plume team spent three weeks trekking across fields of recently-cooled lava and traveling around the Big Island to collect hundreds of samples in order to shed light on how eruptions can affect air quality far and wide. Kilauea’s lower East Rift Zone had been oozing lava for months by the time the team arrived, and it had already become one of the most well-monitored eruptions in history. But while the USGS was routinely monitoring everything from seismic activity to carbon and sulfur dioxide (SO2) emissions, they were missing an important piece of the puzzle: Aerosols. Aerosols are tiny particles of sulfur, chlorine, and metals ejected alongside the gases in a volcano’s plume. They’re a key component of volcanic smog or vog, which can be harmful if inhaled. While a sulfur-rich plume was already being tracked more than 60 miles downwind of Kilauea, the USGS wanted to know more about what that plume contained and how its chemistry was changing over time. “We knew they [the plume team] were good at quantifying that particulate matter.... so we asked them to help characterize close the vent and far away how the chemistry might change and affect different communities,” Patricia Nadeau, a research geologist with the USGS Hawaii Volcano Observatory, told Earther. And so the plume team deployed sampling equipment at seven locations across the island, from the heart of the eruption in Leilani Estates to the community of Ocean View to the south to the Mauna Loa climate observatory in Hawaii’s mountainous interior. Every day, they’d go out to different locations and collect filters containing trapped aerosols, which would be packaged for analysis in the lab. About every fourth day, the team would suit up—fully covered with hard hats and gas masks, as well as monitors that warn you when your SO2 exposure level is getting dangerously high—and trek to a sampling location just a few hundred feet from Fissure 8, the lava vent responsible for producing epic, 200 foot-tall fountains of fire at the height of the eruption. Along for the ride was Harry, a backpack the team had turned into a portable air quality monitoring station by stuffing it full of aerosol and gas-trapping filters. Named after the intrepid volcanologist played by Pierce Brosnan in Dante’s Peak, Harry would be left out near Fissure 8 for about two hours, sucking down toxic fumes while its human counterparts retreated to a safe distance. The days were long and the work nonstop, but after three weeks, the team had what they needed and headed home, with about 600 samples in tow. The plume team in front of an active fissure at night. For Liu, sampling on the front lines of an active volcano was nothing new. Still, she said the lava flows at Kilauea were on a scale she had never experienced. Mason, meanwhile had never worked near a active eruption before, and received an objectively dramatic initiation to this line of work. “To see lava flows from Fissure 8 going so high and fast was incredible,” she said. The sight was also a sobering one, given that the pyrotechnic activity destroyed about 600 homes and resulted in tens of millions of dollars worth of property damage. 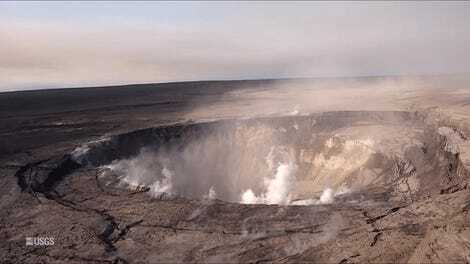 Since the plume team left in early August, things at Kilauea gone quiet. It’s now been a month since lava has erupted from the volcano’s surface, and all other signs of activity from seismicity to emissions are also way down. “These observations indicate that resumption of eruption or summit collapse is unlikely in the near-term,” the USGS wrote in a status update on October 5. For Liu and her colleagues, though, the story is far from over. It’ll be a few more months before they’ve finished analyzing last summer’s samples to flesh out a complete picture of Kilauea’s plume. They’re also hoping to gain insight into what controls the aerosols released by volcanoes more generally, a task that’ll involve comparing air and lava samples from Kilauea with other eruptions around the world. With so much science yet to come, the fact that the plume team was composed entirely of women may seem like a minor footnote in the story. Liu says she didn’t even think about it until someone pointed it out over social media. On reflection, though, she noted that an all-women field crew is “quite rare” in volcanology. “I guess that’s a good thing, that it didn’t [feel] like a thing,” Liu said. Mason agreed. “It’s just so cool that [five] women were the best people to call,” she said.